Impact Soundworks is proud to present the long-awaited next generation of our Shreddage series, beginning with SHREDDAGE 3 STRATUS! With an all-new engine designed using 5+ years of experience & customer feedback, this is the most realistic, powerful, and flexible virtual guitar we’ve ever created. We’re especially excited for the new Console tab, which makes full of use Kontakt 5.7’s new effects, amps, and pedals to give you way more tone possibilities than ever before. Also included are over 30 custom cabinets covering all the classic and modern sounds you could want! Shreddage 3 Stratus is available now for $149, including both the guitar library and Shreddage 3 license. As we release more S3 series instruments, only one S3 license is required, saving you more money with every release! 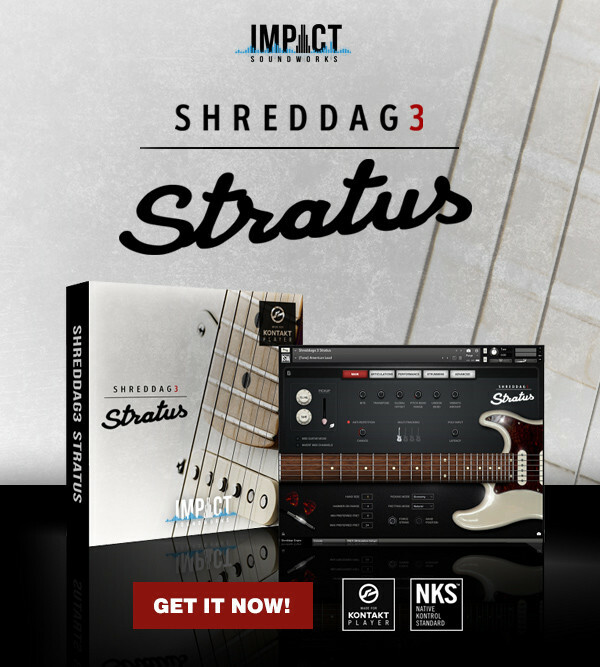 Learn More + Shop Shreddage 3 Stratus Now!